These three Simplex four-wheel petrol engines were originally given the classification of Z6 but were redesignated as Y11 in 1943. After World War 1, a number of railways purchased these small Simplex engines for light shunting work. Although low powered, they were ideal for replacing horses to shunt small yards. The GER purchased Works No. 1931 (Petrol Engine No. 2; LNER No. 8430) in 1919, and the NBR purchased Works No. 2037 (Petrol Engine No. 1; LNER No. 8431) in 1921. Both engines received their LNER numbers in 1930. The LNER purchased the overhauled Works No. 2126 in August 1925. This had previously worked for Preston Water Works in Lancashire. It spent most of its life in obscurity at Greenland Creosote Works in West Hartlepool. Many records fail to recognise this engine's existence, and it was not officially rediscovered until 1949 when the Civil Engineering Department requested a replacement. It was withdrawn in June 1950. No. 8431 (ex-NBR) had completely open sides, and had standard NBR shunter's foot boards fitted. The original NBR cab was an almost standard tall Simplex design, but shutters were eventually fitted above the half-height doors along with rear view mirrors. Kelso recorded huge economic savings with No. 8431 compared to a conventional steam shunter, so it occasionally travelled through the LNER region for various trials. In January 1954, a Crossley 180bhp engine was fitted. This was reputedly from a former World War II tank. No. 8430 (ex-GER) carried the name Peggy after the horse which it replaced, although the name had disappeared by 1933. As with the ex-NBR example, a tall cab was fitted but was made of wood. Both 8430 and 8431 remained at their home yards (Lowestoft/Brentwood; and Kelso/Ware) for most of their lives. No. 8430 was moved from Lowestoft to Brentwood in September 1925, and only two excursions from the Brentwood goods yard are recorded. One excursion (date unknown) was to detach a van with a hot axlebox from a passenger train. The second (as BR No. 15098) was to help with electrification of the GE Main Line in/around 1951. No. 8431 was transferred from Kelso to Ware in August 1928, although the transfer only became official in 1930 when it was given the number of 8431. Both 8430 and 8431 were withdrawn at the end of 1956. The following is for the ex-GER No. 8430 engine. No. 8431 had an engine with the shorter stroke of 140mm, and a two-speed drive chain. None of the LNER's Simplex petrol engines survived into preservation, but one of this type has survived. No. 2029 was ordered by British Portland Cement Manufacturers Limited in 1920 for their Irthlingborough Works in Northamptonshire. After working at various cement works, it was presented to the East Anglia Railway Museum in 1970. It is still at East Anglia Railway Museum, but has substantial frost damage and is awaiting repairs. 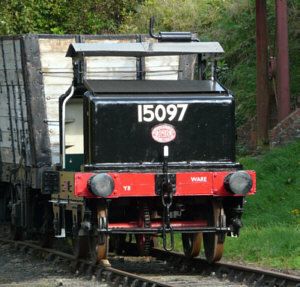 In 2008, Beamish became the new home of a Simplex 4wDM. This was originally built as a 4wPM in 1919 but was converted to diesel and survived into BR ownership. It has currently been restored as BR No. 15097 and carries the name Ubique. This is described a faithful restoration, although it still contains the diesel engine and the original No. 15097 was scrapped by BR. Impetus sell 4mm (OO gauge) and 7mm (O gauge) kits of the Simplex Y11 petrol shunter with two body variants. Thank you to Don Nicol for the photograph of the preserved Simplex at Beamish.